Pre-Super Furry Animals and Gorky's Zygotic Mynci group's hard-to-find catalog is collected here: the Welsh answer to the Stone Roses. The only difference being that its parts were later greater than the original sum. Wales never had the Stone Roses, but they did have Ffa Coffi Pawb. The band, which formed in 1986, featured Gruff Rhys, who would later go on to lead Super Furry Animals. 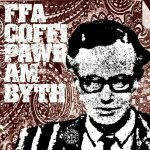 Ffa Coffi Pawb also included Rhodri Puw, who also later joined Gorky's Zygotic Mynci. And considering how some would argue that the lone success story of the Roses is Mani kicking around with Primal Scream, the Welsh group might be the closest thing in recent memory to an original band's success outdone by its members' later groups. This album is a very good start in looking back at what is a rarely-heard and extremely underrated band. If you were to listen to the opening track "Valium", you might think you were hearing the next New Order, or The Killers. The perfect mix of guitar and hi-hat makes it sound retro as they sing the catchy track in Welsh. The song, which is about a guy they used to know who smoked Valium, propels along for nearly three minutes. You won't be able to understand the lyrics, but the strength of the arrangement is more than enough to keep your attention. Think of an equally stellar version of Sumner and Hook's "Krafty" and you'll get its gist. The second track, "Allan O'I Phen", has all the funky Manchester vibe that the Roses were famous for. Light and breezy but still packing a punch, the band downplay the lyrics so the bass and rhythm can seize control. The "ba ba ba"s and sing-along quality are other assets to the pleasing ditty. The diversity of the album is shown on the airy, almost ethereal "Breichiau Hir", or "Long Arms" in English. The synth or keyboard touches makes it soar in the vein of nineties Brit-band Brighter. The lone knock against the song might be that the lead singer sounds at times as if he's singing with a retainer in his mouth. But one quickly forgets this problem with the shimmering guitar-fuelled lo-fi "Gafael Yn Dynn". Here the band finds the hook early and they ride the hell out of it. Not overpowering but not underwhelming either, the riff picks its spots and makes it a great effort. The only problem is how quickly they knock the song off, less than two minutes in. There is almost a Sloan-ish vibe on this album -- smart songwriting, sweet melodies and choruses that pay off coupled with the hand-clapping sing-along quality. This is proven again on the mid-tempo "Sega Segur". "This short translation of a chunk of the song in question only confirms how strange a translated song looks like", Rhys writes in the liner notes about this particular song, which deals with a girl who took too much Ecstasy. "Arwynebol Melyn" has the characteristics of a good Supergrass tune, a la "Pumping Up Your Stereo", before they flesh-out the fade-out. Perhaps one of the signature songs here is "Lluchia Dyfflachlwck Drosta I", which has that swaying, melodic pop quality all over it before veering slightly into Sgt. Pepper turf. But by far the oddest inspiration for a song among this lot comes during the 40-second blip that is "Llosgi 'N Nhy I Lawr", which was done out of anger after The Smiths cancelled a performance in North Wales in 1986. The Stone Roses come to mind on the lovely "Ffarout" which isn't that far out to be honest. Tight and well-crafted, the acoustic guitar works off the electric guitar and other instruments sparingly used. The only song which might sound somewhat dated is "Gwn" which doesn't really have the intensity it should, despite it being a heavy, politically-inspired song. Yet the punchy "Hydref Yn Sacramento" has the needed urgency to deliver the nugget very well. "Cheesy" best describes the paltry Jesus and Mary Chain-ish "Colli'r Goriad", which never gets off the ground.